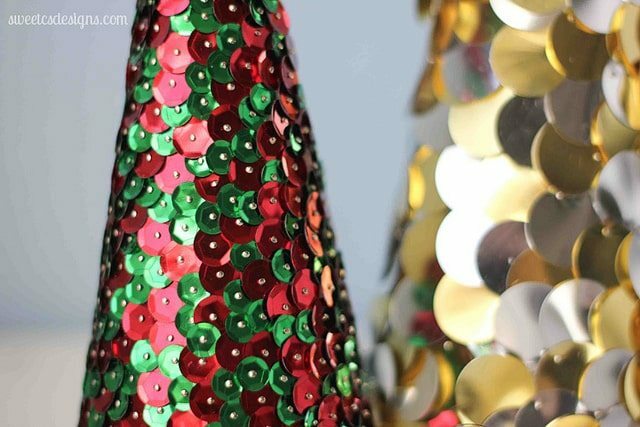 Quick and easy Sequin Christmas Trees are one of the most fun Christmas decorations you can make for your home or to give as a gift! 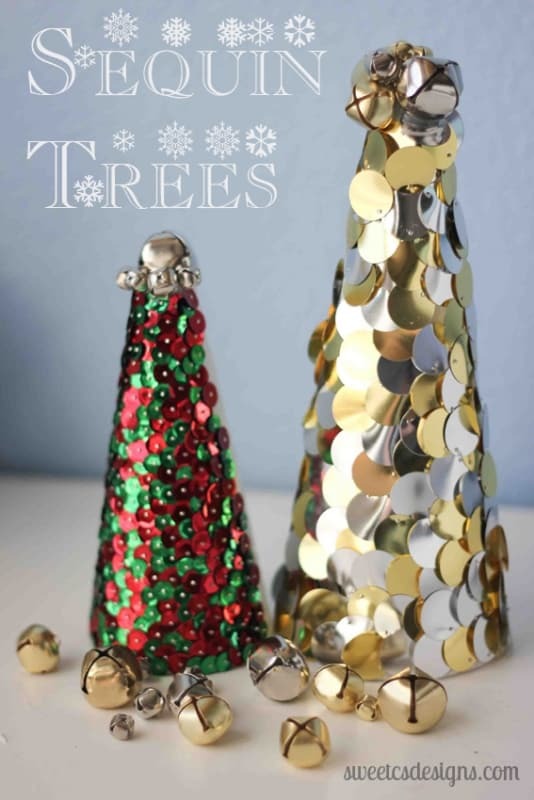 Grab some styrofoam trees, some pins, some sequins, a couple of jingle bells and a good movie… let’s make these pretty trees! While these trees are inexpensive and easy, they are a bit time consuming. Pinning every single sequin in, individually, can take about 1/2 hour to 1 hour- but it’s pretty mindless, so do it while watching your favorite tv show or a movie! Also, I’d recommend waiting until the little ones are in bed before working with so many pins. 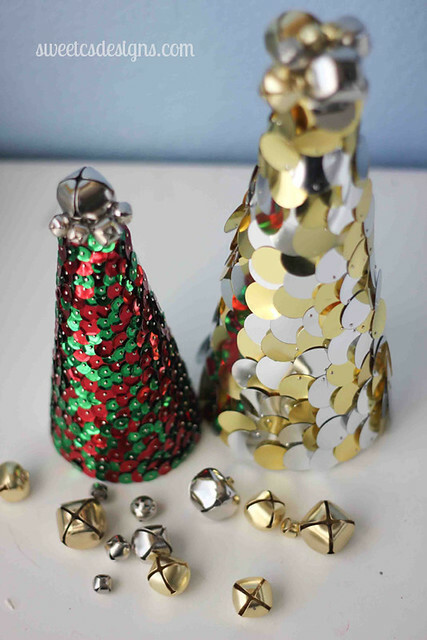 The concept is really very easy- pin the sequins in to the tree! Most sequins you find at the craft store will have a small hole in either the center or at the top. Pin directly through the sequin into the tree- and do that a zillion more times. I made sure there weren’t any spaces by overlapping the sequins. When done, you will have a little empty space on top like a peak of a mountain. With a little hot glue, add a few different sized jingle bells (sold conveniently right next to sequins at most craft stores), and you are done! The texture of these trees is absolutely lovely up close. They look really expensive- I have seen similar trees in boutiques for over $30 a piece! They look wonderful near tealights and twinkle lights- the light shines off in beautiful ways. 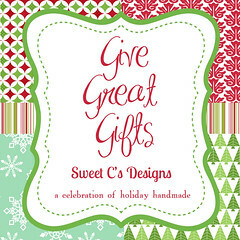 Please keep checking in on the Sweet C’s Blog until Christmas for more fun- the Give Great Gifts series has some awesome crafts, shopping guides and guest posts still to come! 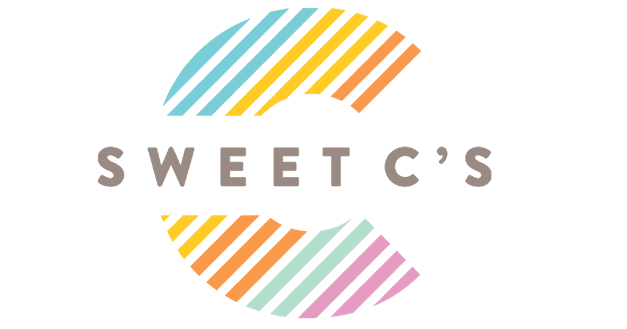 Sign up to follow Sweet C’s via google friend connect, or through my RSS feeds! If you have an Etsy shop, I’d love for you to come and post your gift ideas on the Sweet C’s Facebook page until Christmas! What are some of YOUR favorite under $10 gifts? Hi. I love what I’ve seen of your blog. But, I just wanted to be sure you knew that if viewing on a mobile device any movement on the page results in an advertisement taking over. It limits viewing. Such pretty, sparkly topiaries! You’re right, these will look beautiful in the candlelight. I know they took you a lot of time to make. Thank you for sharing and for creating with STYROFOAM Brand Foam. Those are darling! So glad you linked up with us! I love this idea! You are so very creative! Thanks for sharing @ Show & Share, I will be featuring this tomorrow! My teenage daughters woudl love these. So pretty! I love all the bling:) Thanks so much for sharing! This is fantastic! I admire the patience it took to get them both done, too. Wow! Love this idea! I’ve got some old topiary trees that I’ve been wondering what to do with….now I know! You could also put little gold seed beads on the pin too to add more dimension. Your sequin trees are fabulous. Love them!! Thanks so much, I am so honored! They are time consuming, but really easy to make, and they look even better in person! I can’t wait to have them at a candlelit table- the light will reflect wonderfully! how fun are these bling bling trees??? i just pinned these. so cute! It is, but if you do it while watching a movie, it flies by. It turned out so lovely, it was well worth the time! (the bigger sequin one goes by MUCH faster- but I could only find tiny red and green sequins for the other, sadly). Oooo! I like it! This is like my Christmas ornament that I made for an ornament exchange.